An assortment of the best – almonds, cashews, peanuts, raisins, malted balls – dipped in rich milk chocolate. And now with dark chocolate almonds, cashews, pecans and yogurt covered cranberries. 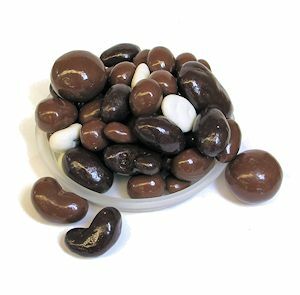 Milk Chocolate [Sugar, Cocoa Butter, Milk, Chocolate Liquor, Soy Lecithin (an emulsifier) and Vanillin (artificial flavor)], Dark Chocolate (Sugar, Chocolate Liquor, Cocoa Butter, Anhydrous Milk Fat, Soy Lecithin and Vanillin), Raisins, Peanuts, Cashews, Almonds, Pecans, Malted Milk (Corn Syrup, Whey, Malted Barley, Wheat Flour, Milk, Sodium Bicarbonate and Salt), Sugar, Yogurt Coating [Sugar, Partially Hydrogenated Palm Kernel Oil, Nonfat Dry Yogurt (Nonfat Dry Milk and Yogurt Culture), Soy Lecithin, Salt and Pure Vanilla], Dried Cranberries, Malt Extract, Coconut Oil, Sunflower Oil, Mono and Diglycerides, Artificial Flavor, Gum Arabic, Corn Syrup, Sugar and Certified Confectioners Glaze. May contain Wheat, Milk, Peanuts, Tree Nuts, Soybeans and/or Eggs.